Making the transition to the civilian workforce certainly comes with its own unique sets of challenges, not the least of which is learning how to write your resume. Which skills are important? How do you take your military experience and translate it for a civilian hiring manager? Will your accomplishments in uniform be as impressive to someone outside of the military? It's a lot to think about, no doubt. 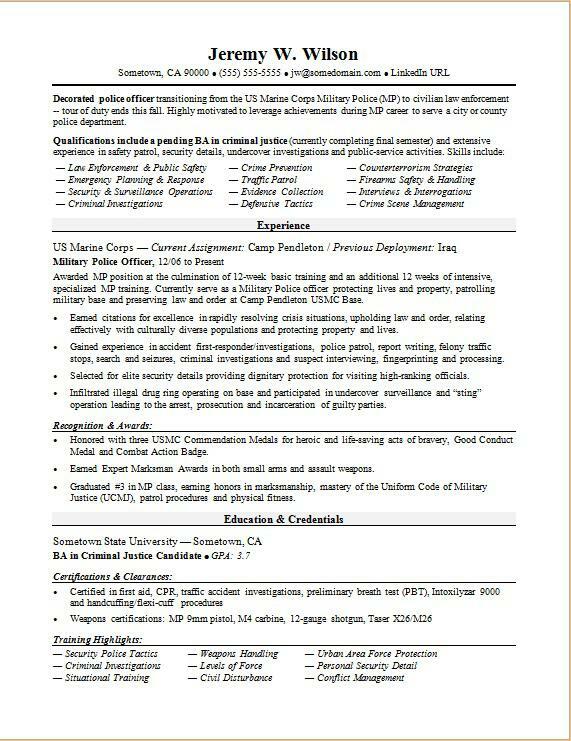 For guidance, view the sample resume for military-to-civilian transition below, and download the military-to-civilian transition resume template in Word. Additionally, you can learn more about military careers on Monster. Decorated police officer transitioning from the US Marine Corps Military Police (MP) to civilian law enforcement -- tour of duty ends this fall. Highly motivated to leverage achievements during MP career to serve a city or county police department. Awarded MP position at the culmination of 12-week basic training and an additional 12 weeks of intensive, specialized MP training. Currently serve as a Military Police officer protecting lives and property, patrolling military base and preserving law and order at Camp Pendleton USMC Base. Earned citations for excellence in rapidly resolving crisis situations, upholding law and order, relating effectively with culturally diverse populations and protecting property and lives. Gained experience in accident first-responder/investigations, police patrol, report writing, felony traffic stops, search and seizures, criminal investigations and suspect interviewing, fingerprinting and processing. Selected for elite security details providing dignitary protection for visiting high-ranking officials. Infiltrated illegal drug ring operating on base and participated in undercover surveillance and “sting” operation leading to the arrest, prosecution and incarceration of guilty parties. Honored with three USMC Commendation Medals for heroic and life-saving acts of bravery, Good Conduct Medal and Combat Action Badge. Though you've likely assumed far greater challenges during your time in the military, writing a resume is no easy task. Could you use some help making sure your resume looks professional and stands out? Get a free resume evaluation today from the experts at Monster's Resume Writing Service. You'll get detailed feedback in two business days, including a review of your resume's appearance and content, and a prediction of a recruiter's first impression. It's a quick and easy way to ensure your skills and experience are being properly presented and are focused on the types of jobs you're interested in pursuing.